Chapin-A beautiful lady went to join the angels in Heaven on Saturday, October 27, 2018. Mrs. Veterie Slice “Mema” was born on November 20, 1919 to the late Charlie Ervin Price and Eppie Smith Price in rural Lexington County. 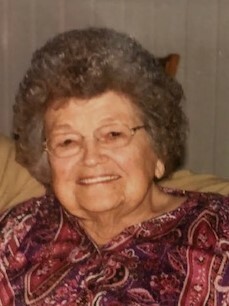 God blessed her with a long and healthy life which enabled her to share her love, wisdom and guidance with many generations of family and friends. Even in the last weeks of her life with her health failing, she was able to find humor in that bright and beautiful mind of hers. She left the Gilbert area when she married Joseph W. Slice of Chapin. Parker (Clay), Heather Gerity, Brandon, Mark, Anthony, Kathy Lynn, Kaitlyn and Walter Slice. brother, Clyverd (Loretta) Price and sister-in-law, Ernestine Price and many nieces and nephews. Mrs. Veterie was predeceased by her parents; her husband; 3 great grandchildren; five of her brothers, McCoy (Nathalie), Hermon (Sylvia), Yvonne, William Pell (Betty), and Hampton (Adrienne) Price; two sisters, Juanita Price Pitts and Laura Price Roland. As a resident of LMC Extended Care, she loved her fellow residents (especially her adopted son, Lee Adams) and took pride in directing them at their tables and giving guests directions. Funeral services will be conducted at 2:00 p.m., Tuesday, October 30, 2018 at St. Jacobs Lutheran Church with burial to follow in the church cemetery. Visitation will be from 6-8 p.m. Monday at Barr-Price Funeral Home, Lexington Chapel.. In lieu of flowers, memorials may be made to St. Jacobs Lutheran Church, 840 Columbia Ave., Chapin, SC 29036. The family would like to extend a special thank you to all of the staff at Lexington Extended Care for their loving care of our Mema.